Schutt (3-31) wreaked havoc at the Branourne Stadium by claiming a hat-trick. India were knocked out of reckoning from the Twenty20 tri-series final after Australia handed the hosts their third successive defeat, the highlight of which was medium pacer Megan Schutt becoming the first bowler from Down Under to claim a hat-trick in the format. Australia outplayed Harmanpreet Kaur’s team by 36 runs. Having failed to secure a single win in the series so far, India are without any points right now and would be aiming for a consolation win over England in their last league match on Thursday. Schutt (3-31) wreaked havoc at the Branourne Stadium by claiming a hat-trick. Her scalps included the in-form Smriti Mandhana (3), veteran Mithali Raj, who was dismissed for a duck, and Deepti Sharma (2). While Schutt cleaned up Mandhana and Raj off the fifth and the sixth ball of the second over. She completed her hat-trick in the first ball of the fifth over by removing Sharma, who gave a sitter to Amanda Jade Wellington at mid-off, leaving the hosts in deep trouble at 26/3. Skipper Harmanpreet Kaur (33 off 30 balls) and Mumbai-batter Jemmimah Rodrigues (50 off 41 balls) stitched a 54-run stand for the fourth wicket, but that was not enough to take the home side to victory. Rodrigues, who scored her maiden international fifty, and Harmanpreet dealt in ones and twos but the big shots just did not come through for the two. Rodrigues was guilty of giving her wicket away by chipping straight down to the fielder. Harmanpreet tried to up the ante by hitting a four and a six off consecutive balls, in the 14th over, but was dismissed off the very next ball, caught by Delissa Kimmince off Ashleigh Gardner. Australian bowlers never allowed the Indian batswomen to settle and took wickets at regular intervals on a placid track. A quick-fire 38 off 26 balls from Anuja Patil did chip in but the asking rate had risen considerably by then. Earlier, put into bat, opener Mooney scored a half century and looked unstoppable, hitting eight boundaries. It was medium-pacer Pooja Vastrakar, who removed two Australian batswomen — opener Alyssa Healy (9) and one-down Ashleigh Gardener (17) — cheaply. While Healy was caught by Rodrigues, Vastrakar cleaned up Gardner. The visitors were tottering at 29/2 but staged a fine recovery from that point to post 46/2 in the power-play. 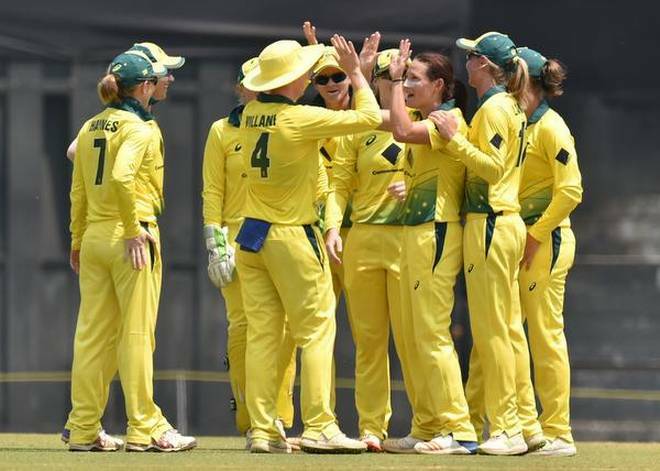 India gave away the early advantage by letting Villani and Mooney conjure a 114- run stand for the third wicket to steer the team out of trouble. In the eighth over, Mooney took on off-spinner Deepti Sharma, hitting her for three boundaries. Villani and Mooney kept the scoreboard ticking stealing ones and twos. 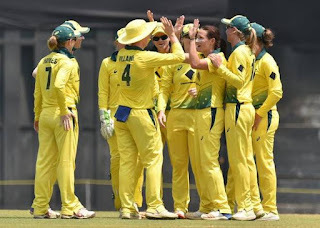 Australia looked good for a big total before India made a strong comeback by removing Villani, Mooney and Ellyse Perry (1) in quick succession to ensure that Australia were able to add only 45 runs in the last five overs on a placid track. For the hosts, Vastrakar was the pick of the bowlers with figures of 2-28.